Russia is one of the few countries in this world with whom India has hardly any irritant and since the end of cold war era importance of Russia India relations have further increased with the United States being left as the only centre of power in the world. In order to make the geopolitical set up of the world more democratic, many centres of power are required and in this respect, India and the former super power Russia with increased strategic cooperation can become new centre of power. The recent one day visit by the Russian President Vladimir Putin to India had further enhanced the ties between time tested friends. Terming the ties with India as ‘privileged strategic partnership’, Russian President said that construction of new nuclear plants besides military and technical cooperation was high on the agenda for talks. He also expressed his eagerness to export liquefied natural gas (LNG) to India and involve Indian giant ONGC (Oil and Natural Gas Corporation) in oil and gas hunt in the Arctic. Currently, Russia is isolated by the US and the European Union (EU) who imposed sanctions on Russia over its adventure in Ukraine. An Asian country like Japan, the world’s third biggest economy, too has joined the West in implementing sanctions on Russia. The Western sanctions left little room for Russia and practically forced it to divert its direction of trade and business to Asia which offers far bigger and untapped markets. During the summit, two sides have decided to revive their good old defense partnership. Till recently, Russia used to command an over 80 per cent share of India’s defense deal but today it has fallen to just about 60 per cent and the US has already taken over as India’s number one defense supplier, nudging Russia to the second position. Both the nations also resolved to give fresh impetus to the defense ties by signing the USD3 billion deals on production of helicopters. This is the first major defense deal under the much famed ‘make in India’ scheme which involves production of state-of-the-art multi-role helicopters by Russia in Indian factories to cut down on costs and time overruns. Another important point in this deal is that India would be at liberty to export these helicopters to third countries. 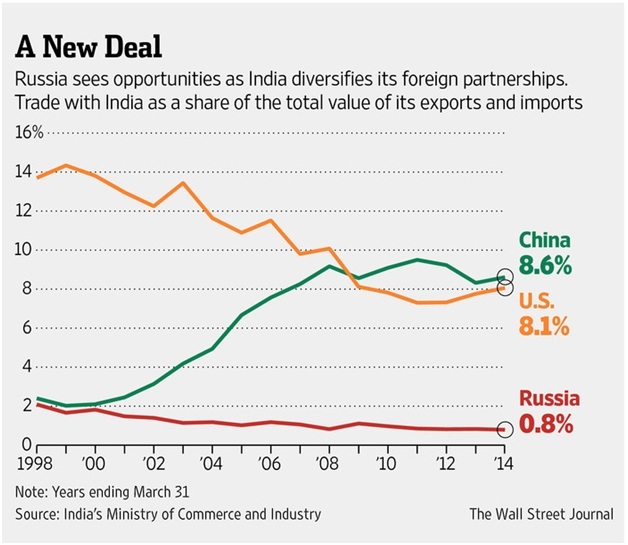 Agreements were also signed in energy and hydrocarbon sector where Russia agreed to supply nuclear reactors to India. The two leaders presided over the signing of a "vision" document setting out a roadmap for cooperation in the sphere of nuclear power where Russia eventually would supply India with 20 nuclear reactors. India being an energy starved nation, development of hydrocarbon sector is lifeline for the future growth of the country. For that matter, Russia also proposed cooperation in hydrocarbon resources including exploration in the Arctic region. Though Russian President remained for less than 24 hours in New Delhi, the cooperation agreements agreed upon by the two nations will help create growth and development opportunity for several years. Indeed the latest visit has opened a new chapter in the long lasting friendship of India and Russia.